MARY HILL LAMAR wrote again from London to her brother Henry Hill in Philadelphia this time including a couple of catty remarks about John and Abigail Adams as well as Ann Willing Bingham and her husband, said to be the wealthiest man in America. London, March 18, 1786. . . . Please make my affectionate compliments to my sister Mrs. Hill, with my thanks for the nice cranberries. Before this gets to hand you will probably see Mr. and Mrs. Bingham, whom I have not seen since their return from France, although I called twice after I heard of their being in London. I am told the extreme of the French fashion, or her own taste, has made great alteration, while on the continent, in her manners, &c. When I mentioned her own taste, it was because she appeared at the opera in a hat unlike anything that ever made its appearance there before or since; fond as they are here of the French fashions. She has been introduced to their majesties, by Mr. and Mrs. Adams, our American plenipo [plenipotentiary], who, by the by, the girls have been to wait on several times, with myself. We have had them to a party of cards and tea, and she has been asked a second time, but as they have not returned the compliment, I think it unnecessary to pay them any farther attention. They seem sensible people, one and all, but quite out of their element. Mrs. Adams has been very handsome, but an indifferent figure, being very short and fat. Miss [the Adams’s daughter Nabby], by some, reckoned handsome. . . .
John Jay Smith, ed., Letters of Doctor Richard Hill and His Children 1798-1881 (Philadelphia: 1854), 260-61. 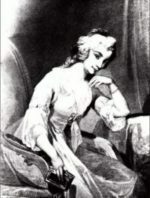 Anne Willing Bingham (above) was the model for an early coin design. More than 23 million non-gold coins of Bingham were introduced into circulation from 1795 to 1808. 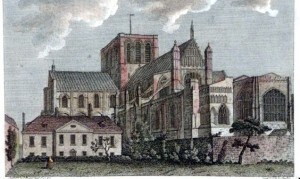 ABIGAIL ADAMS continued to describe the trip she and John took to the West Country of England in a letter to her sister Mary Cranch in 1787. Their tour took them next to Axminster, noted for beautiful carpets. The “manufactory” there was started by John Whitty in 1755 and the quality, colors, and designs of his woolen carpets made them popular with the rich and famous everywhere. 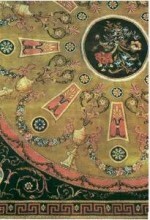 The illustration is a detail from a carpet dated 1791; it is at the Metropolitan Museum in New York City. From Wevmouth, our next excursion was to Axminster, the first town in the county of Devonshire. It is a small place, but has two manufactures of note: one of carpets, and one of tapes; both of which we visited. The manufactory of the carpets is wholly performed by women and children. You would have been surprised to see in how ordinary a building this rich manufactory was carried on. A few glass windows in some of our barns would be equal to it. They have but two prices for their carpets woven here; the one is eighteen shillings, and the other twenty-four, a square yard. They are woven of any dimensions you please, and without a seam. The colors are most beautiful, and the carpets very durable. [Mr. J. Cranch] accompanied us in our journey to Exeter, Plymouth, and Kingsbridge. At Exeter, we tarried from Saturday till Monday afternoon. . . . From Exeter, we went to Plymouth ; there we tarried several davs, and visited the fortifications and Plymouth dock . . . . The natural advantages of this place are superior to any I have before seen, commanding a wide and extensive view of the ocean, the whole town of Plymouth, and the adjacent country, with the mountains of Cornwall. I have not much to say with respect to the improvements of art. There is a large park, well stocked with deer, and some shady walks ; but there are no grottos, statuary, sculpture, or temples. At Plymouth, we were visited by a Mr. and Mrs. Sawry*, with whom we drank tea one afternoon. Mr. Sawry is well known to many Americans, who were prisoners in Plymouth jail during the late war. The money which was raised for their relief passed through his hands, and he was very kind to them, assisting many in their escape. . . .
* Miles Saurey, a linen draper of Plymouth, England, assisted American prisoners at Mill Prison during the Revolution by providing them with food, clothing, newspapers, and cash. Read the conclusion of Abigail Adams’s letter in the next post. Source: Letters of Mrs. Adams, The Wife of John Adams With an Introductory Memoir by Her Grandson, Charles Francis Adams, Volume II, 1840. ABIGAIL ADAMS continues her letter to her sister Mary Cranch describing the trip she and her husband took to the West Country of England in 1787. In Southampton Abigail took a dip. During the 1780s bathing in the sea began to be considered healthful. Proceeding to Weymouth, Abigail was distressed by the poverty she witnessed and the inability of the ordinary folk to better themselves given the circumstances in which they lived. She was proud that in America, in addition to its other advantages, it was relatively easy to acquire property. From Winchester we proceeded to Southampton, which is a very pretty seaport town, and much frequented during the summer months as a bathingplace; and here, for the first time in my life, I tried the experiment. It would be delightful in our warm weather, as well as very salubrious, if such conveniences were erected in Boston, Braintree, and Weymouth, which they might be, with little expense. The places are under cover. You have a woman for a guide, a small dressing-room to yourself, an oil-cloth cap, a flannel gown, and socks for the feet. We tarried only two days at Southampton, and went ten miles out of our way in order to visit Weymouth, merely for its name. This, like my native town, is a hilly country, a small seaport, with very little business, and wholly supported by the resort of company during the summer months. 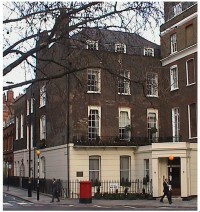 For those persons, who have not country-houses of their own, resort to the watering-places, as they are called, during the summer months, it being too vulgar and unfashionable to remain in London. But where the object of one is health, that of fifty is pleasure, however far they fall short of the object. This whole town is the property of a widow lady. Houses are built by the tenants, and taken at liferents, which, upon the decease of the lessees, revert back again to the owner of the soil. Thus is the landed property of this country vested in lordships and in the hands of the rich altogether. The peasantry are but slaves to the lord, notwithstanding the mighty boast they make of liberty. Sixpence and sevenpence per day is the usual wages given to laborers, who are to feed themselves out of the pittance. In travelling through a country, fertile as the garden of Eden, loaded with a golden harvest, plenty smiling on every side, one would imagine that the voice of Poverty was rarely heard, and that she was seldom seen, but in the abodes of indolence or vice. But it is far otherwise. The money earned by the sweat of the brow must go to feed the pampered lord and fatten the greedy bishop, whilst the miserable, shattered, thatched-roof cottage crumbles to the dust for want of repair. To hundreds and hundreds of these abodes have I been a witness in my late journey. The cheering rays of the sun are totally excluded, unless they find admittance through the decayed roof, equally exposed to cold and the inclement season. A few rags for a bed and a jointstool comprise the chief of their furniture, whilst their own appearance is more wretched than one can well conceive. During the season of hay and harvest, men, women, and children are to be seen laboring in the fields: but, as this is a very small part of the year, the little they then acquire is soon expended; and how they keep soul and body together the remainder of the year is very hard to tell. It must be owing to this very unequal distribution of property, that the poor-rate is become such an intolerable burden. The inhabitants are very thinly scattered through the country, though large towns are well peopled. To reside in and near London, and to judge of the country from what one sees here, would be forming a very erroneous opinion. How little cause of complaint have the inhabitants of the United States, when they compare their situation, not with despotic monarchies, but with this land of freedom ! The ease with which honest industry may acquire property in America, the equal distribution of justice to the poor as well as the rich, and the personal liberty they enjoy, all, all call upon them to support their government and laws, to respect their rulers, and gratefully acknowledge their superior blessings. . . .
Abigail’s letter is from the volume Letters of Mrs. Adams, The Wife of John Adams With an Introductory Memoir by Her Grandson, Charles Francis Adams, Volume II, 1840. The image of the bathing machine was taken from this SITE.